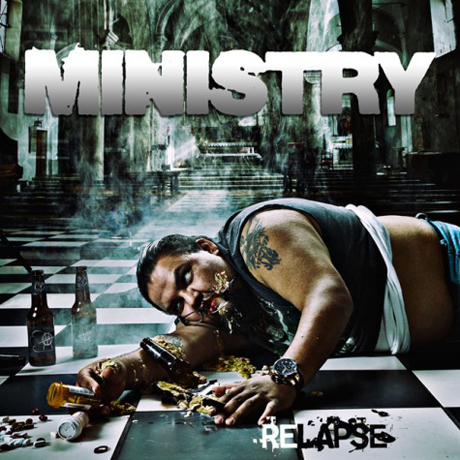 Industrial icons Ministry had us believing they called it quits with 2007's The Last Sucker, but following a few posthumous remix and covers collections, the group have announced their first new album in over four years. It's called Relapse, and that's the off-putting, puke-and-pills-filled cover up above. The album will be released March 30 via bandleader Al Jourgensen's 13th Planet Records, and it will be preceded by iTunes single "99 Percenters," which goes up for sale on Friday (December 23). The song will also be streaming on the group's Facebook page on Christmas. Jourgensen explained that the song, which features the chorus "1, 2, 3, 4, 5, 6, 7, 8, 99 percent," is a rally cry for the Occupy movement. "Putting out this song is the least I could do," Jourgensen told Revolver. "We wanted to fly to New York and protest and get arrested and pepper sprayed. But we can't do it because I got a Christmas deadline on this album. But I'm with 'em in spirit so the least I could do is give them a chant-along song. I'm going, 'Hey man, here's your song. All you gotta do is chant the chorus.'" A tracklisting has yet to be revealed, but Jourgenson told Metal Hammer last summer that the new tunes were the "fastest and heaviest" he'd ever done. Expect more info in the new year.